The key is in the ignition switch. You exceed the operating distance limit (about 30 m [90 feet]). The remote key battery is weak. 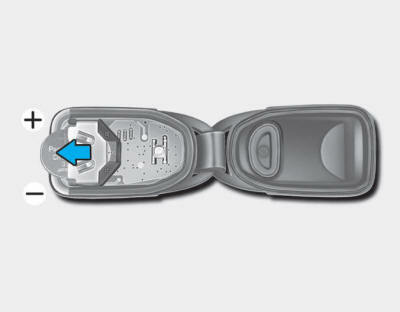 The remote key is close to a radio transmitter such as a radio station or an airport which can interfere with normal operation of the remote key. When the remote key does not work correctly, open and close the door with the mechanical key. If you have a problem with the remote key, contact an authorized HYUNDAI dealer. If the remote key is in close proximity to your mobile phone, the signal could be blocked by your mobile phones normal operational signals. This is especially important when the phone is active such as making and receiving calls, text messaging, and/or sending/receiving emails. Avoid placing the remote key and your mobile phone in the same pants or jacket pocket and always try to maintain an adequate distance between the two devices. Changes or modifications not expressly approved by the party responsible for compliance could void the user's authority to operate the device. If the remote key is not working properly, try replacing the battery with a new one. 1. Insert a slim tool into the slot and gently pry open the cover. 2. Remove the old battery and insert the new battery. Make sure the battery position is correct. 3. Reinstall the rear cover of the remote key. If you suspect your remote key might have sustained some damage, or you feel your remote key is not working correctly, contact an authorized HYUNDAI dealer. An inappropriately disposed battery can be harmful to the environment and human health. Dispose of the battery according to your local law(s) and regulation(s).